The most telling part of the arts portion of last night’s French debate was Stephen Harper’s two attempts to justify his comments on artists as spoiled children. Pressed by NDP Leader Jack Layton to repeat his September 24th remarks in French, Harper avoided the question, but said about artists, "They work hard like other Canadians, but at the same time we have to recognize it's a bit strange to see a gala that's generally subsidized by the government and they're complaining that we cut into the arts." Harper repeated the same line to Liberal Leader Stéphane Dion. The excuse came across as disingenuous. The fact that Harper repeated the statement demonstrates his patronizing attitude towards the arts and underscores the Dion’s charge that Harper advocates being big brother, silencing decent. Harper’s main defense, that his government increased arts and culture funding by 8%, was refuted by Green Party leader Elisabeth May, who spoke that the increase was for the Department of Canadian Heritage as a whole, whereas actual arts funding had gone down. Bloc Leader Gilles Duceppe also took Harper to task on this fact. The best Harper could say was that his tax credit for children enrolled in arts courses would help create jobs for artists. Stéphane Dion however said that the Liberals would double funding to the Canada Council to $360 million. Yannick Nézet-Seguin: Young Montreal Maestro New International Star! For the past few years I’ve been hearing more and more about the extraordinary talent of Montreal-born conductor Yannick Nézet-Seguin: he’s been given appointments by the London Philharmonic and the Rotterdam Philharmonic; this past summer he debuted at the Salzburg Festival leading Gounod’s Roméo et Juliette with Netrebko and Villazon in the title roles; he’s made a series of fine recordings - and he’s only thirty-two! I finally caught up with Nézet-Seguin this week in Montreal to watch him conduct his Orchestre Métropolitain du Grand Montréal (OM). I came away convinced that Nézet-Seguin has the potential to become one of the most important conductors of his generation. 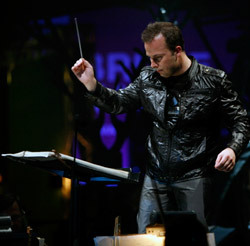 Nézet-Seguin has been artistic director of the OM since 2000. This is Montreal’s second orchestra, behind the more famous Orchestre symphonique de Montréal (OSM); it has its own following, and a large one at that. Orchestre Métropolitain du Grand Montréal Totally in TuneOrchestre Métropolitain du Grand Montréal was formed in 1981 by graduates of Quebec conservatories and music faculties. It gives about seven concerts a year at Place des Arts - also the home of the OSM - but it also plays in churches in the greater Montreal area and serves as the orchestra for the Opéra de Montréal in several productions a year. On this occasion, I heard the OM in the Salle Wilfred-Pelletier, the large hall at Place des Arts in a program of music by Ravel, Berlioz, Rachmaninov and Mussorgsky. Watching Nézet-Seguin open the programme with Ravel’s La Valse, I was struck by his energy and enthusiasm. There are a lot of moving parts when he conducts, but there is little wasted movement. He has the ability to keep his players on the edge of their seats and make them respond to his every wish. To put it another way - as the musicians used to say about Toscanini – “when he looked at you, there was no way you couldn’t do exactly what he wanted”. Nézet-Seguin has that special leadership quality that allows him to take charge and carry his players along with him. By the end of the concert it was obvious that not only was he able to lead them with authority but that they loved the leadership he was providing. No doubt about it - this man is a born conductor. Maestro Nézet-Seguin received most of his musical education at the Conservatoire de musique du Québec, but he also studied conducting with Carlo Maria Giulini. Physically they are very different types, but one can see the Giulini influence in the discipline of Nézet-Seguin’s gestures and in the intensity he projects to the orchestra. In programming Ravel’s La Valse at Place des Arts, Nézet-Seguin was taking a chance. After all, his orchestra is really too small – not enough strings – and the walls are still resounding with Charles Dutoit’s near-definitive performances with the OSM. Dutoit has been gone for several seasons, however, and Nézet-Seguin and his players showed that if they could not be lush, they could be accurate and exciting. There was purpose to this programme. To open the concert, we had La Valse; then, to end the concert, we had the Ravel orchestration of Mussorgsky’s Pictures at an Exhibition. Nézet-Seguin wanted to show his audience what Ravel the composer could do, before they heard Ravel the orchestrator. Not bad at all! After La Valse came Berlioz’ song cycle Les Nuits d’été in a somewhat unusual version - for two singers instead of one. As it happened, soprano Marianne Fiset took ill and could not perform on the previous night and so at that concert, Les Nuits d’été was presented with only one singer, mezzo-soprano Julie Boulianne. It was apparent at the performance I heard, that Fiset was still somewhat out of sorts, but we did get to hear the cycle divided between two voices as scheduled. To my mind, it would have been helpful to have some explanation in the programme as to the issues involved which prompted the choice to use two voices rather than one for this work. The fact is that Berlioz wrote the songs in Les Nuits d’été at different times and for different voices. 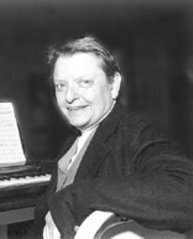 When he finally published the songs as a cycle, he stated that they could be sung by either a mezzo-soprano or a tenor. The best performances I have ever heard – nearly all of them by mezzo-soprano Susan Graham – have been with one female voice. The exception was a superb rendition by tenor Philip Langridge. A two-voice version has been done before, however; there is a recording conducted by Boulez with a mezzo-soprano and a tenor dividing the songs and Berlioz authority Colin Davis has done the same. Nézet-Seguin’s idea was surely that since, in their original versions, some of the songs lie too high for a mezzo and too low for a soprano, why not have two singers and allocate the songs accordingly. In this performance, however, Nézet-Seguin really clouded the issue rather than clarified it. Soprano Marianne Fiset has a voice that is too heavy for most of the songs, and that of mezzo-soprano Julie Boulianne is too light. In fact, Boulianne was frequently covered by Berlioz’ unusually light and transparent orchestration. In my opinion, neither singer was ideal for this music. Soprano Marianne Fiset Charms Audience with RachmaninovThe second half of the concert began with Rachmaninov’s Do not sing, my beauty, to me Op. 4 No. 4 in an orchestration by Leonidas Leonardi and in this lovely, melancholy song soprano Marianne Fiset was in her element. She sounded Russian – excuse me, Georgian, in this case – to the core. I liked this bit of programming. Before Mussorgsky’s familiar Pictures, Néget-Seguin gave us another taste of Russian “soul”. It was a way of enriching a meal that was otherwise just a little predictable. Mussorgsky’s Pictures Come to Life with Superb Playing & Thrilling Brass! Nézet-Seguin didn’t do anything radical with Pictures, an orchestral showpiece, the primary requirement of which is superb playing. We got that in this performance! Interestingly, my most recent hearing of the piece was at Tanglewood this summer by the Boston Symphony under Peter Oundjian and the minor technical blemishes in the OM performance were almost exactly the same as those in the BSO rendering – and the conducting was equally stunning. In Pictures as in La Valse, Nézet-Seguin was somewhat handicapped by the small string section - but his musicians played their hearts out! The sound from the well-balanced brass section was thrilling, especially in the “catacombs” section. More of Yannick Nézet-Seguin & OM in Montreal this SeasonNézet-Seguin and the OM return later in the season with performances of Mendelssohn’s Elijah, Mahler’s Das Lied von der Erde and Bruckner’s Eighth Symphony, the latter part of a Bruckner Cycle. Nezet-Seguin/OM recordings of the Bruckner Seventh and Ninth Symphonies are available on the ATMA label. Nézet-Seguin is already the most successful Canadian conductor ever in terms of the international appointments he holds and the number and stature of the orchestras he has already conducted, or soon will conduct. Later this season, for example, he will appear with the Boston Symphony, the Philadelphia Orchestra, the Los Angeles Philharmonic, the Chamber Orchestra of Europe and the Vienna Symphony, among others. He will make his debut at the Metropolitan Opera in 2010. To keep up with his globe-trotting, check his website. David and Igor Oistrakh play Prokofiev's Sonata for Two Violins, 2nd mvt. 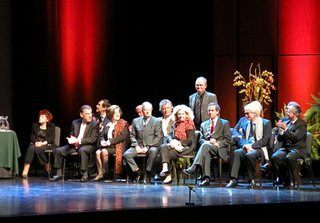 Plácido Domingo put Québec City on the world operatic map when he brought his Operalia 2008 to town. 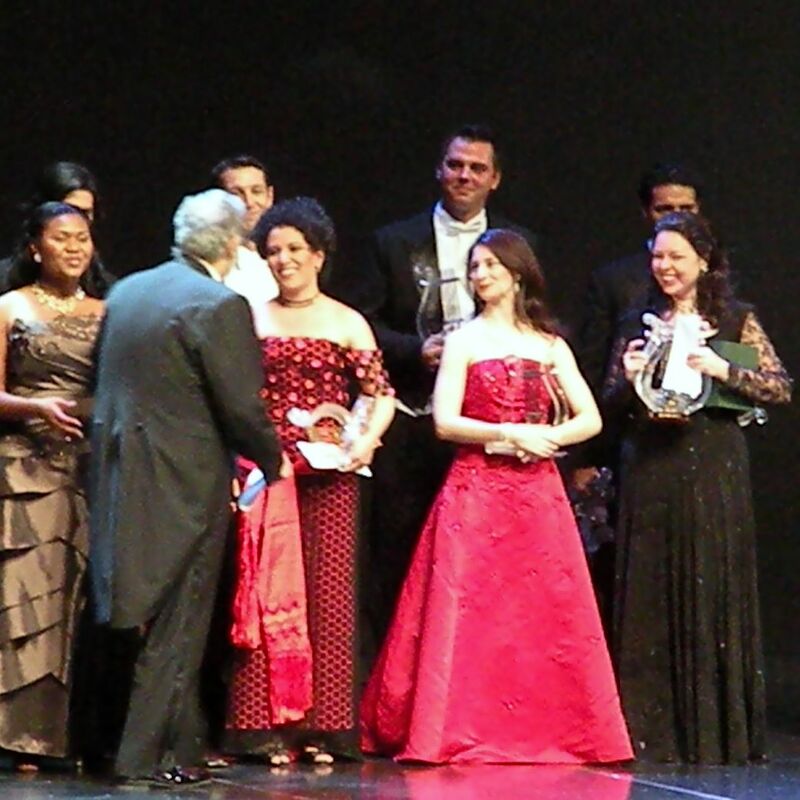 Operalia is a vocal competition which has taken place annually for the past sixteen years in great musical capitals such as Paris, Madrid, Hamburg, Los Angeles and Tokyo. Although Domingo is involved in many projects – heading opera companies in Los Angeles and Washington among them – Operalia is obviously very close to his, and his family’s heart. 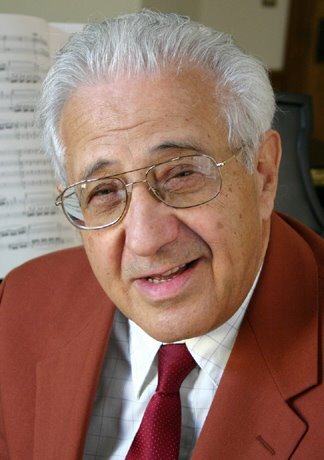 In Québec City, Domingo conducted the final concert of the competition; his wife Marta was a member of the 13-person jury; the Hymne performed by the contestants en masse was composed by Plácido Domingo Jr.; and the film Operalia 1993-2008 was directed by his son Alvaro. Operalia was conceived as a way to help young opera singers advance their careers and it has succeeded in doing just that. 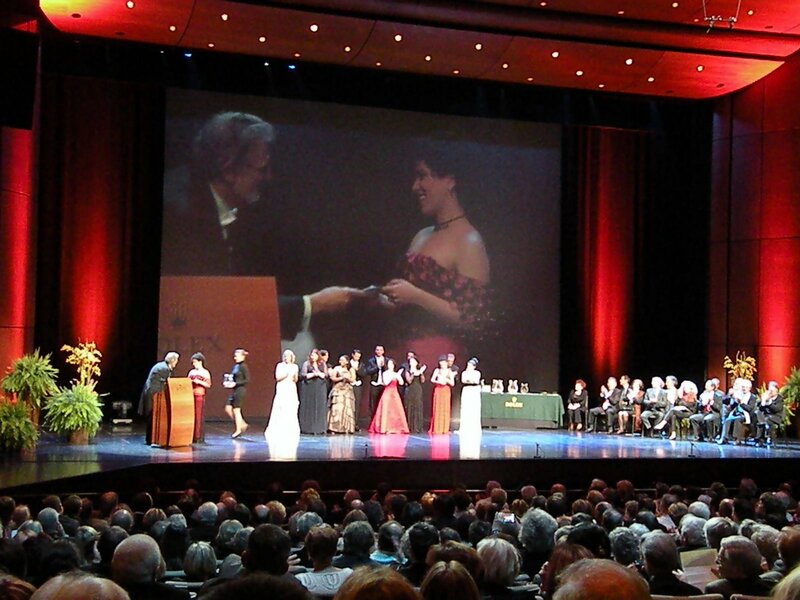 Prize winners over the years have included the likes of Rolando Villazon (1999), José Cura (1994), Elizabeth Futral (1995), Canadian soprano Isabel Bayrakdarian (2000), and Kate Aldrich (2002) heard as Adalgisa in Norma at Festival Bel Canto 2008 in Knowlton, Québec. This year’s competitors were typical. They were in their early to mid-twenties and virtually all of them have completed their vocal training and have embarked on professional careers; what they need now is wider recognition to take them to the next stage. The Operalia jury is comprised of people in a position to lend winners a helping hand. The jurors selected are often administrators of opera houses - among the members this year were Peter Katona, artistic director of the Royal Opera House, Covent Garden; Ioan Holender, head of the Vienna State Opera; and Jean-Louis Grinda, director of the Monte Carlo Opera. There are three main prize categories in Operalia: male (US$30,000/20,000/10,000); female (US$30,000/20,000/10,000) and zarzuela (US$10,000). 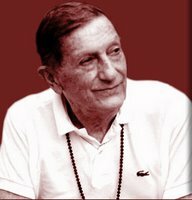 This last category is unique to this competition and honours the fact that Domingo’s parents were both zarzuela singers and he grew up working in their touring company in Mexico. Nearly 1,000 singers apply to Operalia every year. On the basis of audio and video audition tapes, 40 contestants were invited to come to Québec. There was a quarter-final round and then a semi-final round held between September 18-21. 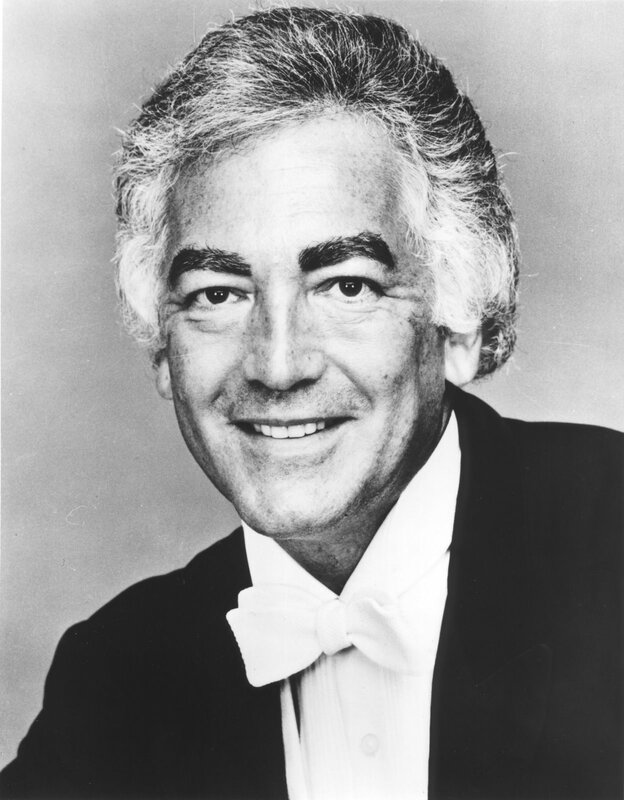 After these preliminaries, 14 finalists remained and each one sang an aria at a concert on September 24, with Domingo himself conducting the Orchestre symphonique de Québec (OSQ). This final concert, at which the winners were announced, was held at The Grand Théâtre de Québec , and the hall was filled to capacity. Microphones (CBC Radio 2 and Espace musique) and cameras (the European television arts channel Mezzo) were abundant. After the singers had finished their performances, the jury returned their verdicts. At Operalia 2008, first prize for male singer went to tenor Joel Prieto. Prieto was born in Puerto Rico and is currently a member of the Deutsche Oper Berlin. For the competition he sang “Una furtive lagrima” from Donizetti’s L’Elisir d’amore. From the outset it was clear that he had one of the most beautiful lyric voices of all the competitors. Apart from some intonation problems, he sang very well. 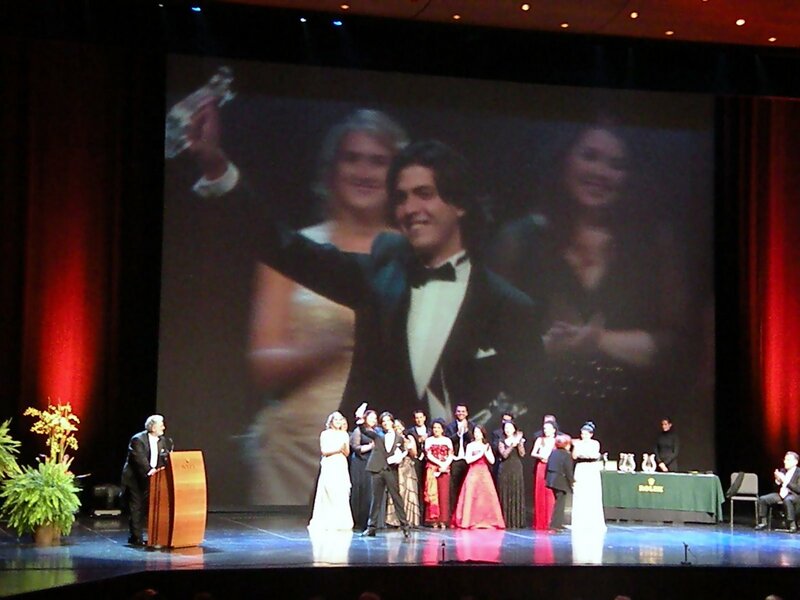 He was even better in his zarzuela aria and also won a prize in that category. 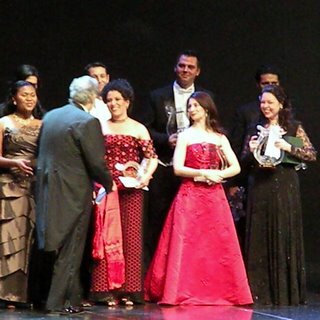 Among the women, Mexican-born soprano María Katzarava emerged the winner with a stunning performance of “Amour, ranime mon courage” from Gounod’s Roméo et Juliette. Ms. Katzarava studied with Ramón Vargas and is a member of the young artists program at the Los Angeles Opera. Outstanding amongst the other finalists, were Ukrainian soprano Oksana Kramaryeva who demonstrated exceptional dynamic and dramatic range in “Ritorna vincitor” from Verdi’s Aïda. Like Prieto, she walked away with two prizes: second prize in the female category and sole winner of the audience prize. Zarazuela –Bel Canto “con Salsa”?A total of four singers were awarded prizes for zarzuela performance, each receiving US$10,000. My favourite was Georgian mezzo-soprano Ketevan Kemoklidze who sang the bouncy and colourful “De España vengo” from Pablo Luna’s El niño judío. More power to Domingo for championing zarzuela throughout the world; its popularity has long been confined to Spain and Spanish-speaking countries, but the repertoire is full of wonderful music that transcends language barriers. For the singers who were fortunate enough to win cash prizes at the competition and catch the attention of some important opera directors, success may well lead to further recognition. 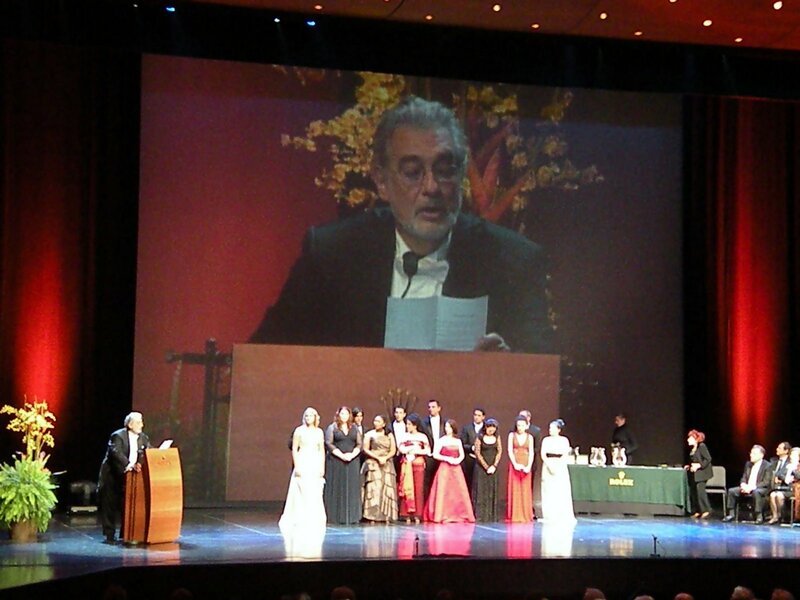 As Operalia literature states,Domingo is committed to personally mentoring the prize-winners as they work to develop their talent and make crucial career decisions. The stars of the evening were rightly the contestants; that said, Domingo’s contribution, not only as MC, but also as music director, was immeasurable. Few conductors could have shown such mastery in such a varied repertoire and fewer still could have provided the detailed and sympathetic support these young artists needed to give their best. Kudos also for the musicians of the OSQ who played superbly. At age 68, Plácido Domingo may be approaching the twilight of a fabulous singing career but as conductor, administrator, teacher and mentor he appears to have the energy and dedication of a man half his age. 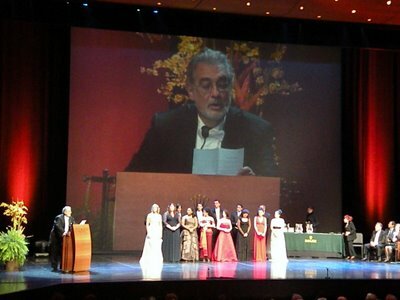 Operalia 2009 will be held in Budapest, Hungary.